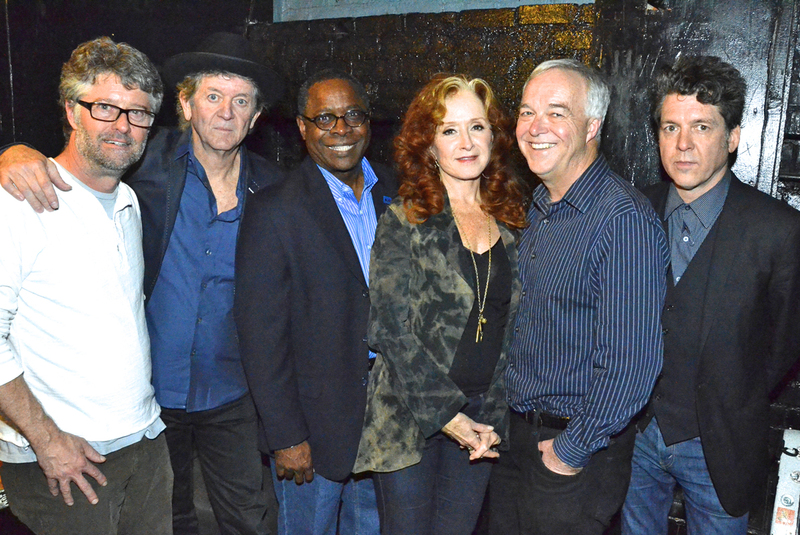 GRAMMY-winning artist Bonnie Raitt (center) poses with MTSU President Sidney A. McPhee (left of Raitt) and Ken Paulson, dean of the College of Mass Communication, before the Americana Music Festival’s pre-GRAMMY salute to Phil Everly at the Troubadour club on Saturday, Jan 25, in West Hollywood. Also pictured is Jed Hilly, Americana’s executive director (far left), singer-songwriter Rodney Crowell (second from left) and singer-songwriter Joe Hentry (far right). The Eagles’ Don Henley and Glenn Frey met for the first time in the club’s front bar. Elton John made his U.S. debut there. The club was where James Taylor first heard Carole King’s “You’ve Got a Friend,” which he made into his own hit. So perhaps it was fitting that MTSU’s College of Mass Communication, on the Saturday before the 56th annual GRAMMY Awards®, went to the Troubadour to create a special moment for its Recording Industry program. Dean Ken Paulson, along with President Sidney A. McPhee and program Chair Beverly Keel, met with MTSU alumni and friends in Southern California. The trio of administrators is working to amplify the visibility of the program, long regarded as one of the best in the nation. On that Saturday, the college partnered with the Franklin-based Americana Music Association for an event at the Troubadour to honor the late Phil Everly of the Everly Brothers. Everly died in January. “This truly was an inspirational night of music,” Hilly added. MTSU President Sidney A. McPhee poses with members of Maybe April, a singing trio that includes MTSU students Kristen Castro (right of McPhee) and Katy Bishop (right of Castro). The group also includes Nashville resident Alaina Stacey (left of McPhee). 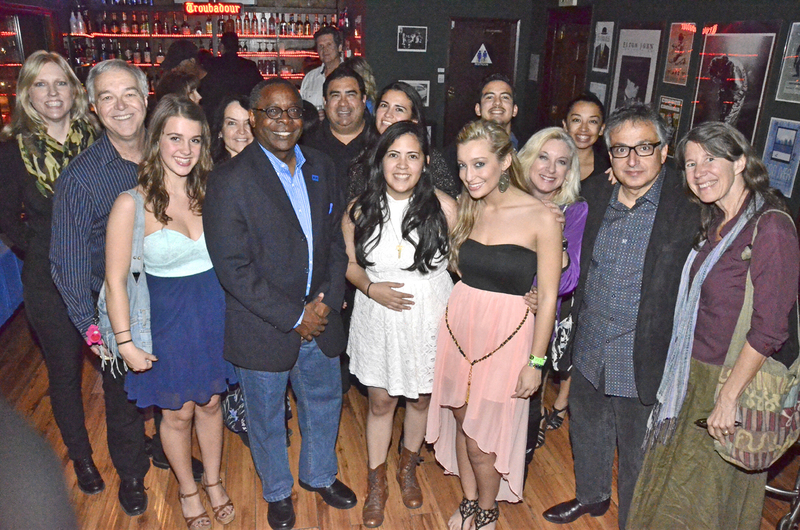 Mass Communication Dean Ken Paulson (second from far left) and Recording Industry Chair Beverly Keel (far left) hosted the MTSU alumni and industry event Jan 25 at the Troubadour club in West Hollywood. Paulson, who became dean last July, forged a partnership between MTSU and Americana, which advocates “American Roots Music” around the world. The association’s tribute to Everly, who lived in Nashville, was a perfect venue for the college to make its presence known on one of music’s biggest weekends, he said. Visiting the Troubadour on Saturday were sophomores Katy Bishop and Kristen Castro, both Recording Industry students, who were in the GRAMMY spotlight during the weekend. Both are part of a Nashville-based trio called Maybe April, which also includes Nashville resident Alaina Stacey. They three met at a GRAMMY summer camp in 2012. Maybe April performed in Thursday night’s “A Song Is Born” Grammy Foundation® legacy concert and played at the official GRAMMY after-party on Sunday. “It’s really humbling,” Castro said. “We are bragging now about the pivotal roles our former students continue to play in the recording industry,” Paulson said. 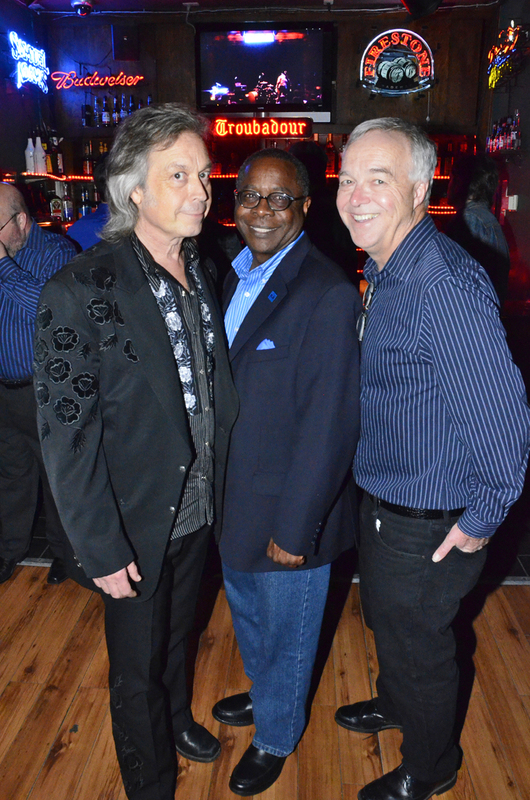 TSU President Sidney A. McPhee (left) with singer-songwriter Jim Lauderdale and Ken Paulson, dean of the College of Mass Communication, at the university’s Jan. 25 reception at the Troubadour Club in West Hollywood before the Americana Music Festival’s pre-Grammy salute to Phil Everly. On Sunday night of GRAMMY weekend, MTSU was among the presenting sponsors of a Leadership Music alumni reunion at a venue less than a mile away from Los Angeles’ Staples Center, the site of the GRAMMY telecast. Nashville-based Leadership Music holds an eight-month training program each year for rising industry figures. Paulson is on its board of directors and executive committee. Founded in 1989, it has more than 900 alumni, including nearly four dozen current and former heads of record labels. Four former MTSU students — Brett Eldridge, Chris Young, Eric Paslay and Lady Antebellum’s Hillary Scott — recently had simultaneous songs on a recent Billboard Country Airplay chart. More than a dozen MTSU alumni/former students and faculty have been nominated for GRAMMY Awards in the last three years, and seven have won the coveted miniature gramophone. Thank you to Andrew Oppmann (andrew.oppmann@mtsu.edu) and MTSU News and Media Relations.